Aretha Franklin brought church to the White House. Yes, the legendary Queen of Soul turned a recent all-star gospel concert at the White House into a romping, stomping, praise and worship service. Her appearance was part of the In Performance at the White House series that paid tribute to the fundamental role gospel music has played in the American musical tradition and the important artists and repertoire that have marked its vibrant history. 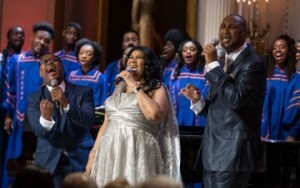 Franklin opened her set in the East Room singing the hymn “I Love the Lord He Heard My Cry,” and then was joined by the Williams Brothers on “Higher Ground,” a song she produced for her 1987 gospel album, One Lord, One Faith, One Baptism. They closed with “Precious Memories,” a tune produced by the late King of Gospel James Cleveland and featured on Franklin’s 1972 Amazing Grace. Other performers included pastor Shirley Caesar, bishop Rance Allen, Darlene Love, Tamela Mann, Emmylou Harris, Lyle Lovett, Rodney Crowell, Rhiannon Giddens, Michelle Williams and the Morgan State University Choir, with T. Bone Burnett serving as executive music director and Billy Maxwell as music director. President Obama and first lady Michelle Obama personally invited Franklin and the other guests to celebrate the power of gospel music in America. The White House and President Obama also personally asked for the producers and transportation company. Executive producers Peter and Bob Kaminsky, Mark Krantz, Cappy McGarr. Jim Corbley executive producers for WETA Washington, D.C, Talent Executive David Paley. Transportation and Logistics by Billy Amato for Bermuda Limousine International.